Issues around social media may feel new, but technology has always created conflict in the way we grieve. [I]f you’re reading this, three things are true. You were born. You will die. And now, thanks to the internet, you’ll be publicly mourned. Loved ones will change their profile pictures to photos of you. Stories will be shared on Facebook, Twitter, Weibo, VK. People may even snap selfies of themselves attending your funeral. As familiar as we’ve become with the digital world, we’re still in the midst of adapting to our emotion-filled existences lived online. As social media evolves, we’re changing the ways we interact. The result: new etiquettes and new normals for every aspect of the human experience. Walter has tracked the evolution of grief back to the Stone Age. From the development of writing and mass literacy to photography and the recording of sounds and images, all had an identifiable effect on how we mourn. Some academics see a strong parallel between grief on the internet and the advent of photography in the 19th century. “That was revolutionary, this idea that you could have an image of the deceased,” says John Troyer, director of the Centre for Death and Society at the University of Bath. He’s also a member of the Order of the Good Death, a group of funerary professionals, academics and artists working to demystify death in a culture that fears it. Post-mortem photos are considered shocking now in western culture, but there’s an ancient precedent for the practice. Taking likenesses from the bodies of the dead dates back at least to Roman times, when death masks were cast in wax. The masks would then be displayed at home and sometimes worn at funerals. 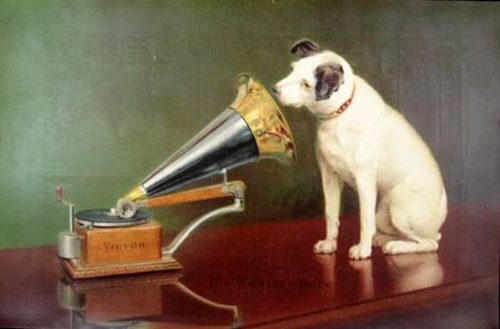 Nipper the dog, now recognised as the mascot for audio label HMV, was originally painted listening to an Edison phonograph recording — as he sits perched atop a coffin. One of the technology’s imagined uses would be the preservation of the voices of the dead. Death masks were used in more recent history, before the invention of photography, to capture a likeness of the deceased, particularly of important people. Some museums display death masks of notable figures, including the poet Dante and Napoléon Bonaparte. A form of the Roman tradition of wearing the masks has returned on Facebook, where users in mourning often change their profile photos to those of lost loved ones. The practice is also reminiscent of Georgians wearing black armbands, which served as visual signals the wearer was bereaved. Grief, experts say, used to be expressed in public. In the modern world, however, our lives allow only so much time to mourn. Jobs keep us busy, families are on schedules. In the US, the situation is exacerbated because there is no federal bereavement law allowing people time off to grieve. We’ve always talked to the dead. 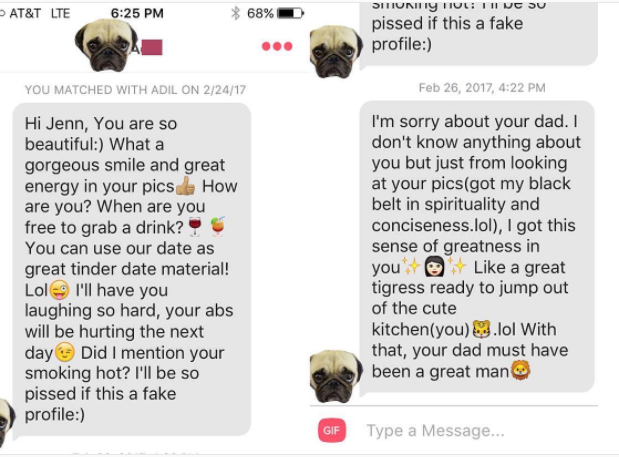 This kind of talk has now made its way onto the internet. A message posted to a dead friend or a remembrance on a birthday demonstrates someone’s memory lives on. Social media lets you address the dead directly and demonstrate that their memory lives on. Social media gives us the illusion that the dead are still among the living. You can go to a Facebook or Twitter profile to read the person’s posts and look at their photographs. You can address them directly and post on their timeline. One of the most contentious issues around online grieving is the funeral selfie. It’s just what it sounds like. Mourners pull out their phones, snap photos of themselves and other bereaved, and post to their favorite social media sites. To many, it seems gauche, even self-centered. It’s the latest example of a new death practice and it feels shocking to some people. A famous Tumblr even documented the trend until 2013, when it stopped updating. For a generation that’s grown up with phones and social networking, Cann says the selfie is just another component of their visual diaries. She says she’s seen that in her own daughter, who had surgery when she was 6 years old and asked to have her photo taken as soon as the operation was over. She wanted to document that moment. There are much darker taboos than whether it’s acceptable to snap a selfie at Gran’s funeral, like the deaths no one wants to talk about. Miscarriage, sudden death, suicide, voluntary euthanasia. These are “complicated deaths,” says The Order of the Good Death’s Sarah Chavez, who also co-founded Death and the Maiden and helps run Death Salon. Unlike the sad but expected death of an older person or an ill patient, these can be controversial endings that make people uncomfortable. The response to these deaths can be very different. Rather than an outpouring of support, the bereaved can feel isolated — and sometimes worse, Chavez says, speaking from experience. Three years ago, Chavez’s unborn child was diagnosed with a fatal disease. When she told anyone, even medical professionals, the reaction was same. People mourning these deaths may look to social media, hoping to find people who’ve experienced similar traumas. Online social groups also provide a barometer to see how people will react. It’s not always for the better. Chavez said she scoured the internet for people who had experiences similar to hers. 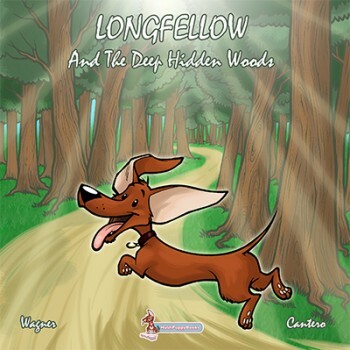 She found few. And those who posted their experiences overwhelmingly faced hostility. A woman she knew gave birth to a stillborn child and, in her grief, got a tattoo of the child’s scan. She then took a photo and posted it to social media. The response, from hundreds of people, was devastating. Private, safe forums have sprung up. Facebook groups have been created for people processing these deaths to seek support from others feeling the same emotions. Sun setting on gravestones at Abney Park Cemetery in London. So how should you respond to bereavement online? It’s not very different from how you’d respond offline, says Daniel Senning, a manners expert and spokesperson at the Emily Post Institute, an etiquette organisation. Those close to the deceased should be told in person, but social media is appropriate for making sure a person’s wider circle sees the news. As for offering condolences, Senning says there’s nothing wrong with responding to the news of a death in the medium you heard it. But that doesn’t mean you have to. Senning says a handwritten condolence note carries the most weight. “In today’s rich communication environment, in making the choice to send a handwritten note, the medium itself becomes part of the message,” he says. As it always has, the way we mourn is evolving. 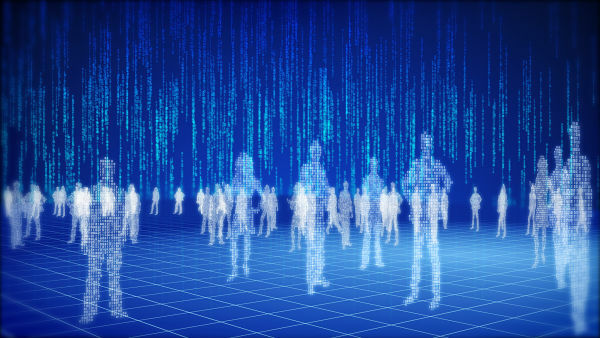 The internet is democratizing grief, even if the technology leaves us uncertain. But it always has, if that’s any consolation. Cast aside “like rubbish” and turned away even by nursing homes, these elderly outcasts are given dignity at the end of life by volunteer groups outraged by their plight. YANGON, MYANMAR: There she lay, on the ground in the darkness of night, moaning in pain as rats – drawn to the smell of blood from the lacerations on her body – nibbled at her wounds. The elderly woman had just been involved in a road accident. But instead of getting help, the driver had abandoned the woman next to a rubbish dump by the road to fend for herself. Daw Khin Ma Ma said her stomach churned at the sight of the battered old woman who was eventually conveyed to her nursing home. “Her rib bones were broken, some of which had pierced her lungs. 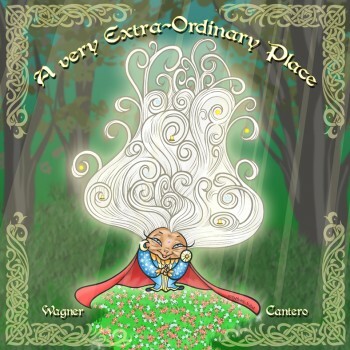 We could see a hole in her back that had been gnawed on by the rats,” she said. The woman died some six months after arriving at the home. 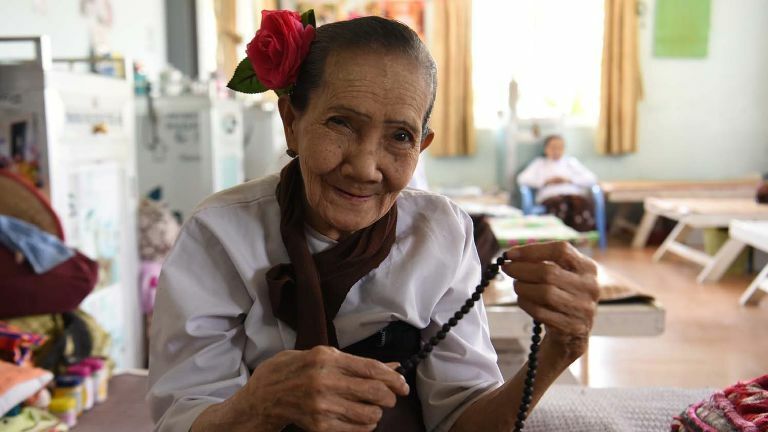 Daw Khin is the vice-president of Twilight Villa (See Sar Yeik), a nursing home in Myanmar which takes in abandoned sick elderly citizens whom other homes turn away. This horrifying episode is just one example of why she is so dedicated to helping this group. Cases of seniors being left abandoned by families near markets, railway stations and even cemeteries are on the rise. “These grandpas and grandmas at our nursing home have been cast aside at hospitals and under bridges like rubbish,” she said with heat. Twilight Villa is tucked in a quiet corner surrounded by thatch and bamboo houses, an hour’s drive from downtown Yangon. It started out with just eight senior citizens housed in a one-storey building in 2010, but today, it operates out of a modern four-storey building that includes an intensive care floor, courtesy of generous donors. The home currently has capacity for about 70 people, but there are 50 more on the waiting list. It takes in only those over 70 years of age who are ailing and without any traceable family. 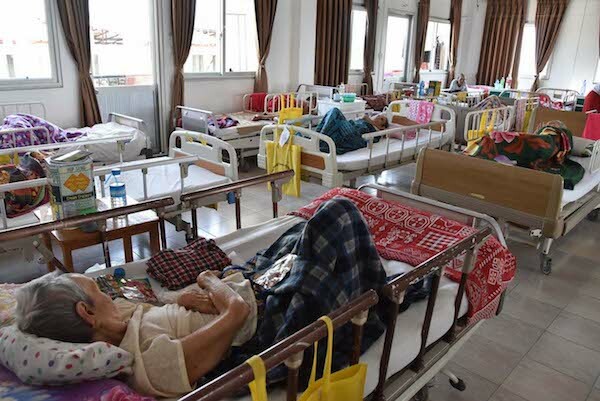 Daw Khin is among a small but growing number of individuals and local non-profit organisations that have stepped forward to help the sick elderly who are in the last years or even months of life. They have no training in nursing nor geriatrics, driven only by their passion to provide this group with dignified end-of-life care. 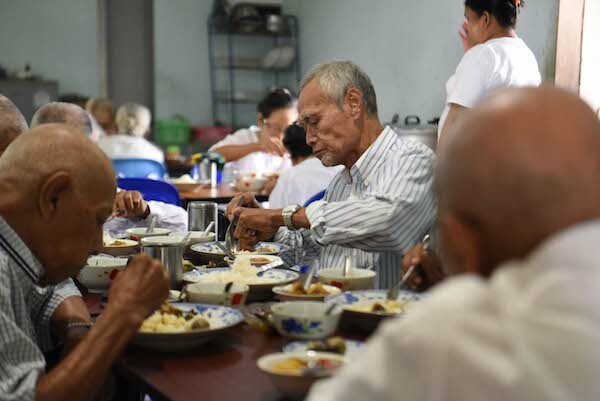 Daw Khin, a criminal lawyer by profession, co-founded Twilight Villa along with local philanthropist and award-winning writer Daw Than Myint Aung in 2010, after they found that nursing homes were unwilling to accept the sick elderly. She said that some of these seniors are referred to them by the police, and they have little memory of their identities. “Sometimes in the pocket of their jacket, there would be a note with just their name and age, such as Daw Pu, age 80. That’s all. When we ask them more, they can’t remember anything else,” she said. Photos of volunteers with the residents at Twilight Villa. 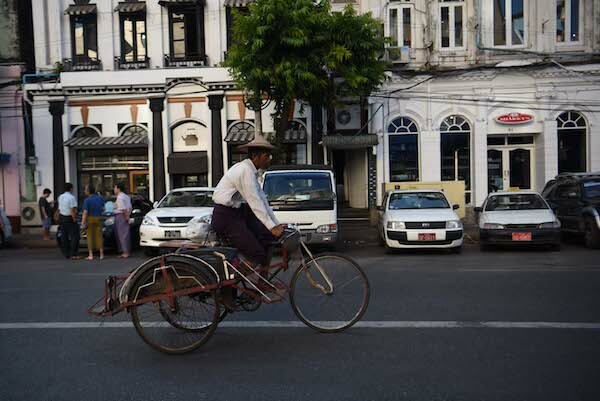 Daw Khin fumed at how some caregivers go to great lengths to abandon these seniors – even using different modes of transport to ensure that they can’t find their way home. “They might be transported in a car, then a trishaw, and then by ferry to the other side of the river where they’re abandoned,” she said. Some are dumped because they had suffered a stroke or some mental illness. “When we ask them where they live, they would say, ‘a market is near my house, and I have little grandchildren’. If they could remember more details, we would surely send them back,” she said. 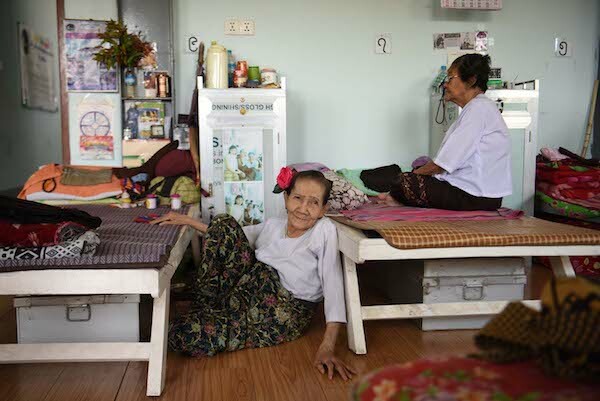 Then there are those like 87-year-old Daw Kyi Kyi, who was referred to the home after her husband and two sisters died. She has no children. Like Twilight Villa, the group Save The Aged focuses on the sick elderly who have nowhere else to go. It was started by a group of 15 young, public-spirited volunteers who were so moved by their plight, they took to the Internet and social media to rally help for them. So successful were they that – for a country with a low Internet penetration rate – they managed to raise enough funds solely through social media to open a nursing home in 2015. They started out by repairing the homes of these old folks and helping them with expenses such as for food and medicine, as well as conveying them to the hospital when they were sick. They had no donors initially, and most of their expenses were borne by the volunteers. With no physical office, they communicated via WhatsApp and social media, posting pictures and videos of their activities on Facebook. As their digital presence grew, they managed to get donations and more volunteers, especially among the young. Save the Aged currently provides care and accommodation to around 25 homeless elderly, all aged above 65. 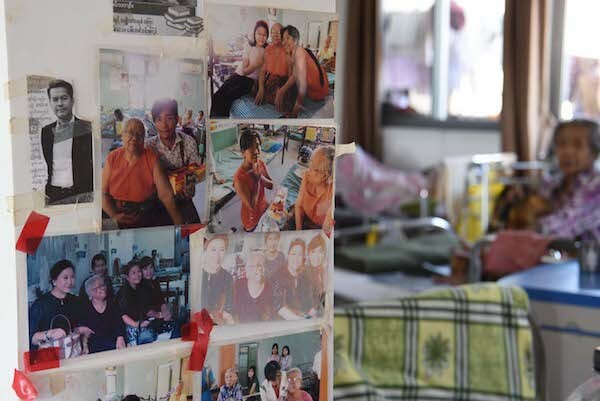 Resident Daw Kyi Kyi Khin, 85, was living alone and surviving on occasional donations when some Save The Aged volunteers brought her to the home. However, funding continues to be an issue for these NGOs – a problem made even more acute in a poor country like Myanmar. Daw Phyo said Save The Aged would like to do more but is limited by the lack of resources. The NGO relies solely on donors, who include Myanmar nationals overseas in countries such as Singapore, South Korea and Australia. When they were building the home, they had to pay for the construction in instalments – and at one stage, they ran out of funds. Thankfully, another appeal for funds online managed to raise enough to complete the project. Twilight Villa, too, relies mostly on public donations. The government’s Social Welfare Department provides the organisation with 25,000,000 kyats (S$26,000) a year in subsidies but they can only use it to buy rice. Daw Khin said she would prefer to have more flexibility with the subsidy, for medical supplies or to pay their employees. AN AGED HOME WITHOUT ELDERLY? But more than that, she would love to see the day when there is no more need for homes such as hers. She cited the example of one home for the aged she knows of which – curiously enough – has no seniors living there. The residents in that village in the state of Kachin have learnt to value and respect their elderly folks for the part they have played in society, and so everyone chips in to take care of them in their twilight years, she said. “If a family is too poor to take care of an elderly person, they will bring that person to another family who will take care of him or her. The whole village takes care of the elderly. That’s why there is no old person in the home for the aged. “This is excellent. We need this to be the situation in every family,” she said. Embrace the idea of death for a better life. It’s a concept that few wish to dwell on, but one that will eventually become a reality for each of us. For some of us, it comes rushing up sooner than we’d like, and suddenly the hands of the clock are moved up to five minutes till midnight. For others, the hands move at their normal pace, but our minds linger on what those final moments will hold. The truth is that we are all dying. Every last one of us. But by learning to accept death, by allowing the ticking clock to drive us to greater heights rather than to deeper despair, we can truly live. And in choosing to live in the face of death, we not only improve the time we have left, but also set an example for others so that they might do the same. Whether you’ve recently found your own clock unexpectedly moved forward or if you simply find your eventual end more discomforting than you’d like, there are lessons to learn here that will make the remainder of your life not mere a series of days, but beautifully alive. As a culture, we don’t like to talk about death—it’s one of our staunchest taboos. But the problem with this is that we don’t deal with it. We pretend it doesn’t exist, that the clock isn’t ticking at all. 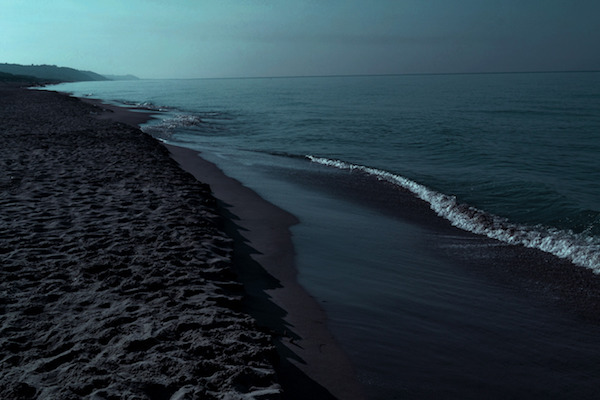 And so because we don’t deal with death in a meaningful way, we become divided into two camps—those who are paralyzed by the fear of death, and those who feel it will never happen to them. Both views are mistakes. Those who are terrified of death are limited by it. They are confined to what is safe, and live lives of mental agony. Those who feel invincible, on the other hand, lack the motivation that only an awareness of our limited time can bring. But when we embrace death, when we acknowledge it by openly talking about it, and when we can accept that it is inevitable, we can make use of it. It can be our friend. Dealing with your own impermanence is painful. It means making yourself vulnerable and open. It means intentionally processing things you’d rather tuck beneath the rug. But when you do, when you accept and acknowledge, you can move past the fear of, or indifference toward, death, and in doing so, you may just find life for the first time. Learning how to live in the face of death means learning to love yourself. It means you learning to be kind to you. This means several things. First, it means, as Jobs said, avoiding the idea that you have something to lose—forgive yourself for any perceived failures. The burdens you place upon yourself, the weights you pile onto your shoulders—take them off. They’re not a big deal. This doesn’t mean shirking your responsibilities toward those you love and care about. It doesn’t mean that you don’t work to make the world a better place. This simply means that you don’t carry these things as a weight. You don’t constantly berate yourself for not attending to them well enough. You do your best and move on. If you have a habit of being unkind to yourself, tapping into the awareness of death is an empowering tool that can help you forgive yourself. And once you forgive yourself and let go of your fears of imperfection and underachievement, you’ll have so much more room in your life for the things that truly matter. Considering the reality of death brings perspective. It helps us see what is truly important. What matters to you? Is it your family? Is it your web of relationships? Are you committed to a cause? Are you bent on creating something beautiful with your life? Are you spiritual or religious? What deserves your time? Likewise, what are you doing that is wasting your time—for many, the thought of death brings this to mind first. Are you working overly long hours or spending time with people who don’t truly value you? Are you obsessed with the future at the cost of living in the moment? Once you’ve acknowledged death as a part of life, you can use this to drive you trim the fat and focus on what’s really important to you. It forces you to examine your life, and like Socrates once suggested, the examined life is the one worth living. In an interview with the Guardian, Holly Webber, a British woman diagnosed with terminal cancer, has this to say about how her perspective has changed since her diagnosis. Allow death to grant you perspective on your priorities, and you’ll gain the life you truly want. You’ve heard the old cliché, “Carpe diem,” which is Latin for “Seize the day”. This phrase is the essence of what death has to teach us. Be present. Live in the moment. Love the people in your life with all your heart and mind and soul. Because in a hundred years, those business reports will be dust. Your money will be gone. Your fears and burdens won’t matter. And that should make you feel free, not fearful. So be open to the idea of death. Talk about it without fear or denial. Use it to shed your woes and gain a better perspective on your priorities. Above all, use death to live. It’s one of the best things you can do for yourself, as well as for those who love you. 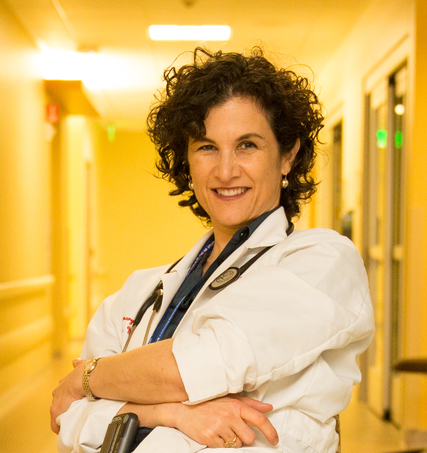 Dr. Zitter confronts the sort of scenario that haunts me because she works in specialties that are sometimes seen as contradictory: pulmonary/critical care and palliative care. In her new book, she refers to the usual intensive care unit approach as the “end-of-life conveyor belt.” She argues that palliative care methods should be used to slow down and derail the typical destructive I.C.U. approach that often torments people it cannot heal. Over the past few years, quite a few studies have indicated that physicians are less likely than the general population to receive intensive care before death. Many doctors choose a do-not-resuscitate status. 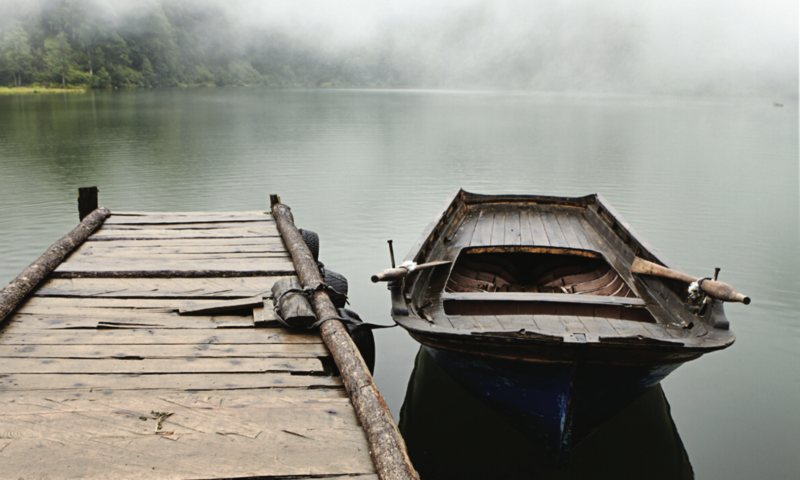 Dr. Zitter highlights the insight upon which her colleagues base their end-of-life decisions. According to Dr. Zitter, even what are intended to be temporary intensive care measures can put a patient on that conveyor belt to anguish and isolation. She writes of breathing machines, feeding tubes, cardiac resuscitation, catheters, dialysis and a miserable existence prolonged within long-term acute care facilities. In an account of the evolution of her own ideas about doctoring, she also explains why it remains so difficult to change intensive care units so they can better serve the terminally ill.
“Extreme Measures” analyzes a complex cluster of suspect but ingrained attitudes that bolster hyperaggressive methods. Medical training fosters a heroic model of saving lives at any cost. American can-do optimism assumes all problems can and should be solved. Both doctors and patients tend to subscribe to a “more is better” philosophy. If technology exists, surely it should be used. Physicians’ fears of litigation plays a part, as do patients’ fantasies of perpetual life. For too many, death remains unthinkable and unspeakable. Other case histories in “Extreme Measures” are more troubling because their moral implications are less obvious. After a dramatic brain bleed from a major clot, a 45-year-old she calls George faces an operation that cannot return him to who he had been. His wife wants to know what Dr. Zitter would do if he were her husband. She explains that her husband would accept paralysis if he could remain communicative with her and their children at home. 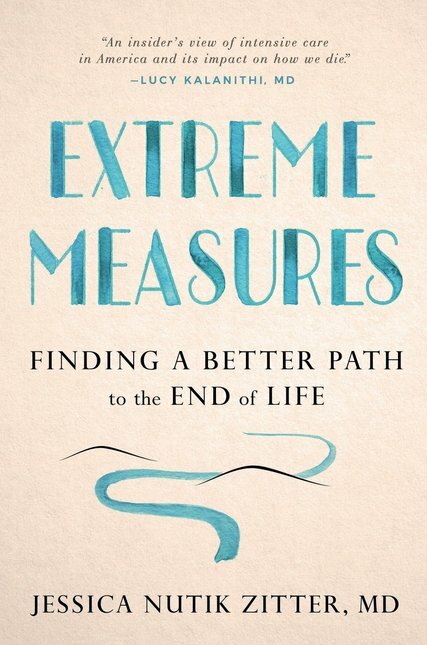 “Extreme Measures” includes a number of stories that explore the difficulties of talking about the subject of death with dysfunctional families, wracked by depression or feuds, and across racial, religious and ethnic divides. Often and to her credit, Dr. Zitter finds herself baffled, unsure of how to balance cultural priorities, human needs and medical possibilities. Throughout, she struggles personally and professionally to redefine common responses to terminal conditions. 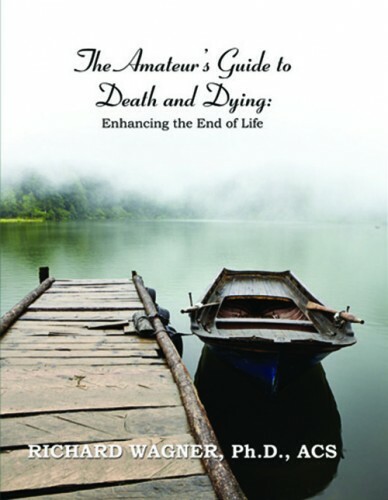 For readers who wish to avoid the end-of-life conveyor belt, Dr. Zitter concludes “Extreme Measures” with some practical advice on, for example, procuring a Physician Order for Life-Sustaining Treatment (POLST), a legal directive that emergency responders, paramedics and emergency room doctors are supposed to follow (but sometimes don’t, as Paula Span reported in The Times earlier this week). Passionately and poignantly, Dr. Zitter reminds us that “conveyor belts, regardless of their destination, are not meant for human beings.” Sometimes less is more. [I] am a doctor who loves to use technology. But I also understand its limits. As an intensive care physician, I have great respect for the tools I have been trained to use. They have helped me rescue people from the jaws of death. But these tools can do more harm than good when used without first having an honest communication about what they can’t do. Take Linda. She was born with a defective heart valve, which was replaced when she was in her 50s. She had a pacemaker implanted at the same time. But an errant pacemaker wire chafed the delicate replacement valve, which slowly began to build up scar tissue. It was a subtle undoing, not enough to be obvious but enough to cause increasingly serious health problems. Her heart problems were compounded by kidney failure and a recurring buildup of fluid in her lungs. She became increasingly fatigued and bedbound. Linda’s poor medical status made a second valve replacement operation very risky. Her cardiologist recommended that she go across the country to a highly respected medical center in the Midwest that specializes in such procedures. Its cardiac surgeons were considered the “A” team for managing problem valves. Linda’s husband, John, a civil engineer, was confident that reshaping Linda’s valve would restore the rest of her body to health. It would just take cool heads, some design thinking, and the steady hands and expertise of these spectacular surgeons. John possessed the education, resilience, and ingenuity to overcome most obstacles and, when it came to saving his wife’s life, he would spare no effort. John hit the ground running, inserting himself into the medical team with confidence. He was pleasant but persistent, unafraid to ask questions or express opinions. The operation was successful, but Linda encountered several severe complications afterward. The doctors included John in conversations about these complications as they cropped up, and even solicited his preferences regarding next steps for her. 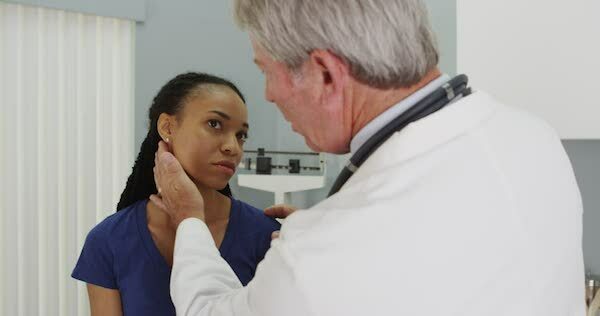 They continued to discuss with him the minutiae of her physiology and listen to his opinions on which drug or nutritional formula to consider next. There was always another treatment, another high-tech intervention to try. But the one thing the doctors didn’t offer was the larger truth. Linda was dying. Enlarging blood clots, bleeding deep within her abdomen, the inability to breathe without the support of a machine, profound and progressive weakness, and the deficits of her sick liver: This was an avalanche no “A” team could prevent. In the third month after the operation, Linda’s suffering growing by the day, John reached out to me through a mutual friend. I listened to his exhausted voice on the phone. It was clear that he was broken and overwhelmed, but he was still struggling to fight each of Linda’s medical problems. While John knew about every medical treatment available, he was blind to the fact that his wife was dying. Even as her body was breaking down in painful and gruesome ways, even as she asked him to let her die, he felt that it was his duty to keep fighting for her life. All of Linda’s specialists had, no doubt, wanted to do their best for her and for John. But they were unable to say the words that this suffering man needed to hear. There was no outright incompetence, no obvious neglect or laziness, no ill intention — only doctors, the best of the best, extremely smart and eager to help, providing the world-class, organ-focused care they had been taught to provide. At my suggestion, John asked to talk with a palliative care specialist. Palliative care is a relatively new subspecialty in medicine which focuses on caring for the whole patient instead of just the failing organ. To do this, its practitioners are highly trained in the management of all symptoms that come with serious illness, as well as the communication skills required to share important information about prognosis and treatment options that other doctors often avoid. Although palliative care has been proven to benefit seriously ill patients in intensive care units, Linda’s team hadn’t offered her this option. With the support of a palliative care doctor, John acknowledged that it was time to honor Linda’s request to be disconnected from the machines that were keeping her alive. She died shortly afterward. But the trauma of Linda’s prolonged dying process left John with a sense of failure, profound pain, and a grief so complicated it would take years to unravel. Specialists with cutting-edge technical skills and the technology to support them are indeed a type of “A” team. But they often lack a different crucial skill, one I believe all doctors should hone: the ability to communicate bad news. Without that they are an “A” team of technicians, not physicians in the truest sense. A true physician, to my mind, tends to the whole patient, not just her organs, and cares for the human behind the disease. Unfortunately, Linda and John’s experience was another manifestation of how our system often treats patients who are dying, focusing on cure rather than care, and chasing fantasy even when cure is not an option. We physicians must come out from behind our machines and high-tech treatments and do something that can be more difficult than replace a heart valve: talk with our patients and their family members about what is really going on. We owe patients this essential information so they can understand the range of options, and their limits. Each of us — physician, patient, and family member — must look carefully at our collective tendency to celebrate technology and to assume that more is always better. The authors analyzed data from the Texas Cancer Registry and Medicare to assess the treatments administered to 3666 patients with ovarian cancer who died between 2000 and 2012. Seventy-seven percent of the patients were Caucasian, 15% were Hispanic, and 7% were African-American. (One percent of patients were classified as “other.”) Only patients who had received 13 months of Medicare coverage before death were included in the analysis. Most (72%) patients had been enrolled in hospice but only 64% were still enrolled when they died, the study team noted. Median enrollment was 20 days. “In the final 30 days of life, 381 (10%) had more than one ER visit, 505 (14%) more than one hospital admission, 593 (16%) ICU admission, 848 (23%) invasive care, and 418 (11%) life-extending care,” the authors reported. Ten percent (357 patients) received chemotherapy during the final 2 weeks of life. Ethnic and racial disparities in end-of-life care remained statistically significant in multivariate analyses adjusting for year and age at death, tumor stage, comorbidity index, income and education level, and location of residence. Race and ethnicity correlated more strongly with outcomes than income, education, or geography. Hispanic patients were also more frequently admitted to the ICU (OR 1.37; 95% CI: 1.05-1.78; P = .02), while African-American patients more frequently received multiple ER visits or underwent life-extending procedures (ORs 2.20 and 2.13, respectively; P < .001 for each). The findings show that “important disparities in use of end-of-life care persist among racial and ethnic minorities,” the authors concluded. Another NYC-based comedian, Shalewa Sharpe “developed her sly yet goofy style in Atlanta where she was raised,” according to her website. For more insightful, intimate observations, you should check out her album, Stay Eating Cookies. SNL’s Pete Davidson has been open about his father’s death, on 9/11, throughout his career as a comic. The joke above is hardly about grief, but it was just too good not to include. You should really watch the video, his delivery is on point. Plus, he’s got a phenomenal follow-up joke that I don’t want to spoil for you. Alison Zeidman is currently a writer for TruTV’s Adam Ruins Everything. 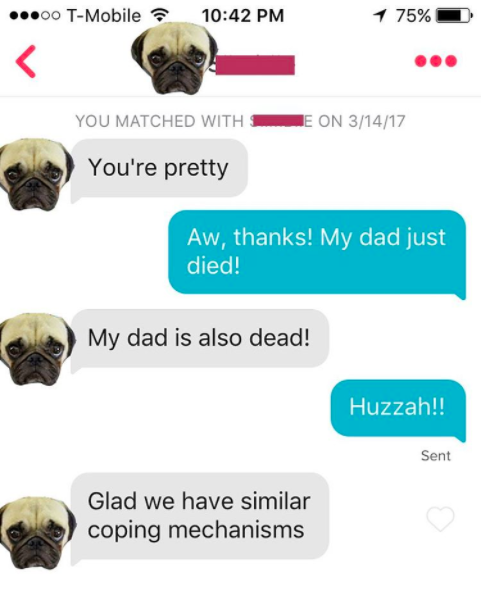 She wrote this gem of a joke about her dad, who passed away in 2014. Like others on this list, Zeidman took to social media to express herself at the time. 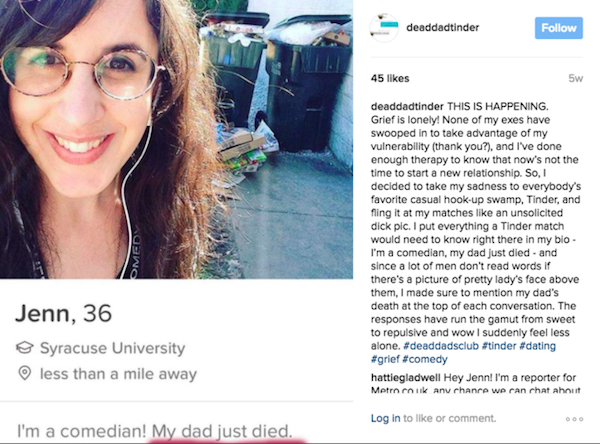 And like Alyssa Limperis, she wrote a satirical article about the grief she was experiencing; A Father’s Day Sale for the Recently Deceased Dad. Both comics have appeared on Calogero’s podcast, which you can listen to right here. Look for Part 1 HERE!